SALE PRICE Tag, 2-5/8" x 5-1/4"
SOLD Tag, 2-5/8" x 5-1/4"
HOLD Tag, 2-3/8" x 4-3/4"
American Retail Supply offers a variety of Sold Tags and Hold Tags. 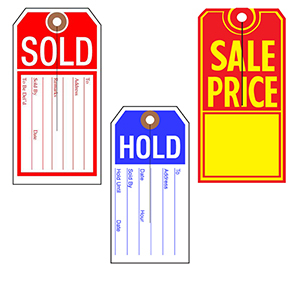 Sold Tags are used to Inform you and the client that an item has been sold. A Hold Tag is used to remind you that the item is on hold for a specific client. With these Sold Tags being so bright colored, it creates a high visual impact. We offer many different sizes and these tags come in 500 per box. Unstrung means that the Tag does not have a string with it. Most likely you would be using a tagging gun with this. This will allow you to attach the sold tags without damaging your items. Strung is when tags come with a string attached to it. The string is extremely convenient. The string allows you to tie the tags around any item without harming your product.